One of the things I love about my Healthy Living Course is that the recipes are filling and delicious. I really just took my own personal faves and made them healthy. I took out processing, chemical-filled packaged, unhealthy ingredients and make everything from Mother Nature grown foods. Now I know that that’s not always going to happen, but it should be the norm. Cooking should not be optional when it comes to living a healthy lifestyle. Especially if you want to get off the diet roller coaster, boost your immunity, feel energized and be productive. head on over the our website to learn all the details – registration is open. In today’s cooking lesson, I’m going to show you one packaged food you start to make at home, and that is vegetable stock. Even if you are not a vegetarian, honestly, it is actually better than most store bought chicken and/or beef broths. It is full of immune boosting, gut healing, energy enhancing, taste bud loving ingredients. 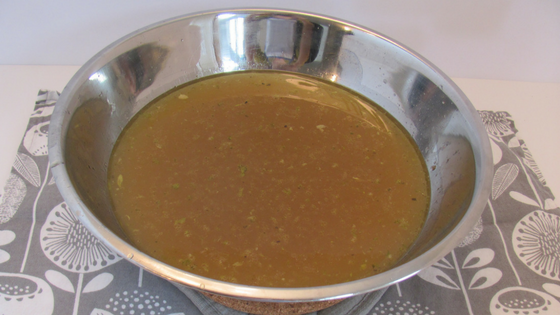 In this video, you will learn how easy it is to make homemade vegetable stock (recipe below). p.s. I laughed the entire time I watched it…check out that crazy curl on the side of my head! You can play around with the seasoning you use. There are no strict guidelines when it comes to making a vegetable broth. You can even use all your scrap pieces of vegetables, fresh herbs and spinach instead of kale. Add all ingredients to a large soup pot. Bring to boil, reduce heat to medium-high and gently boil for 30 minutes. Place a strainer over a large bowl and strain the broth into the bowl. You can use it immediately, or freeze in an airtight container or plastic freezer bags for up to three months.